What is LinkedIn Advertising & How Can it Increase Sales? What Is LinkedIn Advertising and How Can It Be Used to Increase Sales? LinkedIn is an advertising platform worth tapping into if you’re selling a product or service to business owners or working professionals. It is most suitable for B2B marketing. The adverts are quite prominent on the page and are visible in the right side bar as you scroll down the homepage to view your connections’ updates, as well as on profile pages, the search result page, groups pages and on the inbox. When users click on the ad they are taken to the page of your choice, which can be an existing page on your site, or a landing page optimised for a specific advert and tailored to your target customer. How can LinkedIn advertising increase sales? The main benefit of LinkedIn advertising over other platforms is the ability to highly target your audience based on job title, job function, industry, geography, age, gender, company name, company size, or membership of a particular LinkedIn group. This specific targeting means that any leads you receive are highly qualified and the conversion rates should be increased. For this to work you need to have a clear idea about who your target customer is. To give an example, say you are offering discounted office cleaning services. There’s no point in business development professionals seeing those ads, instead you should target people with the job title ‘Facilities Manager’ or similar. You need to consider who within a business would be interested in your product and who would hold the purse strings. Those are the people that you would want to target. To have the best results it’s worth testing multiple ad variations to see which have the highest click through rates and the highest conversion rates. LinkedIn allows you to have up to 15 ad variations so you should split test and then run with the most successful. Once your ad copy has persuaded a prospective customer to click on your ad, it’s very important that the landing page is optimised to encourage conversions, which could be anything from requesting a quote, checking availability or downloading a whitepaper. There are too many exit points on regular site pages. A good landing page clearly directs the user to the advertiser’s desired outcome with no distractions to take their attention elsewhere. When advertising on LinkedIn, you are given the option of either paying per click or paying per 1000 impressions. The former is the most common choice; LinkedIn only recommend using the latter if you are familiar with the cost per impression method of paid advertising. The minimum cost per click is US$2, which is higher than other platforms, however the highly targeted nature of the ads means that you’re only paying for high quality leads. As you drill down on your target audience, LinkedIn’s advertising platform will show you roughly how many people your audience will consist of. They also give advertisers a suggested bid range, which gives you an idea of the bids that your competitors targeting the same audience are making. In order to determine your daily budget, you should multiply your maximum bid by the number of clicks per day that you would like. The amount you will pay per click will depend on the competition. The figure will be between the minimum of $2 and whatever your maximum bid is. If your ads aren’t showing, it’s likely that you’ll need to increase your bid. 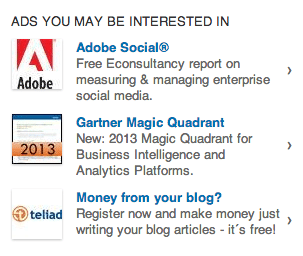 Ads on LinkedIn generally take the form depicted here. There is a headline (up to 25 characters) in bold, a short description (up to 75 characters) and a thumbnail image. The brevity of the advert means that LinkedIn advertising is most suited to promoting a product or service that is easy to describe in a short sentence. Otherwise, consider offering something simple that will then lure your prospect into learning more about your business, for example, LinkedIn advertising is a suitable place for promoting a free report or whitepaper. Of course with data capture, your leads then enter your conversion funnel and you have the opportunity to market to them in the future. With regards to the image, your business logo is ideal if you’re looking to build brand awareness. With such a teeny picture, it’s necessary to choose an image that is simple yet eye catching. There is also a text only advert that is shown in locations including the top of the LinkedIn homepage, this is one place that your ad might show up. If you have a clear idea of who you want to target, take a look at LinkedIn advertising. Put the details in and see what suggested bid range comes up. If this fits into your advertising budget and overall business plan, why not give it a go? If you have any experience with LinkedIn advertising, please feel free to leave us a comment below. We’d love to hear how it works for your business.